You are going to Watch Fairy Tail (Official Dub) Episode 1 English dubbed online free episodes with HQ / high quality. Stream Anime Fairy Tail (Official Dub) Episode 1 Online English dub The Fairy Tail. Natsu and his cat partner Happy travel to the town of Hargeon in search of a dragon named Igneel. There they meet Lucy, a young wizard who is determined to join Fairy Tail, the most rambunctious wizards’ guild in the Fiore Kingdom. Lucy meets a wizard claiming to be the famous Salamander of Fairy Tail, who uses his charms to trick young women into coming aboard his ship so he can kidnap them. Lucy nearly falls into the same trap, but Natsu rescues her and reveals himself to be the real Salamander. 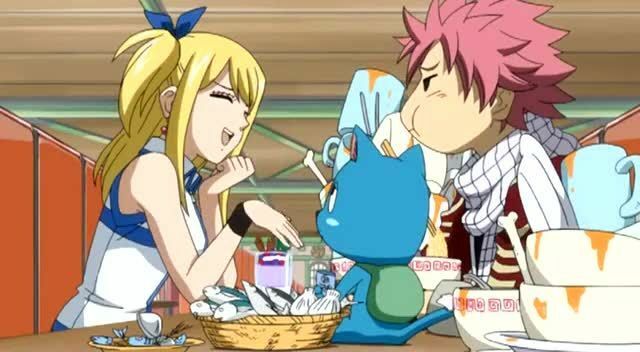 Natsu invites Lucy to join Fairy Tail, which she accepts. 4.8 / 5 - 186 ratings.